You would have to be living under a rock in Florida not to know that I’m the FIRST one to call out racism against Black people. I call out racism so much that I have been called racist myself. That being said, WFTV Channel 9 in Orlando is having a debate between Patrick Murphy and Alan Grayson, to be aired August 12. That debate will NOT include Pam Keith, Reginald Luster, or Rocky De Le Fuente. The reason is because none of the three is polling 15%. Luster and De Le Fuente have for the most part been silent. Pam Keith, not so much. Keith has said that WFTV is being racist and sexist in keeping her out of the debate. She told the Miami Herald that basically this station is keeping people from knowing about her candidacy, and doing a disservice to women and minorities. This sentiment was later joined by the Florida Chapter of NOW in a press release where they called on the station to allow Pam Keith to debate. The Florida Progressive Caucus, without commenting on the claims of racism and sexism, said all candidates should be allowed to debate. Surprisingly, and don’t die of a heart attack people, I, the president of The Democratic African American Women Caucus, was the only one who said Pam Keith should NOT be allowed to participate in the debate because WFTV was NOT being racist or sexist. Pam Keith doesn’t meet the requirement of 15% in polls. She may not like it, her supporters may not like it, but that is the reality of the situation. At what point does Pam Keith take some responsibility for where her campaign is? The bar of 15% may be too high. The bar of 15% may be unfair. The bar of 15% may be unreasonable. The bar of 15% is NOT racist. There is entirely too much racism in this world for false claims. I get that Pam Keith wants to participate in this debate badly. I get that the exposure could possibly generate much needed funds for her struggling campaign. The last FEC report showed her having $2488.00 cash on hand. That doesn’t mean the label of racist should be attached to the television station, and I can’t, and won’t, support that. If Keith had said she should be on that stage because of her qualifications, she would be right. To use racism in this manner cheapens her abilities, and it also hurts people who are genuinely victims of racism and sexism for that matter. Let’s face it, the only -ism that Pam Keith is suffering from is broke-ism. It takes money to raise name recognition. It takes name recognition to raise poll numbers. In this case, it takes poll numbers to participate in the debate. Politics is a contact sport. It isn’t for the weak or the feint- hearted. Crying racism to try to bully WFTV into allowing her to participate in the debate is basically a punk move. For someone who says she is the alternative to the status quo that people are tired of, she is looking an awful lot like Al Sharpton to me. Someone said to me that she is desperate, and desperate times call for desperate measures. Ok, she can cry wolf. That doesn’t mean I have to join in on that mess. It takes MONEY to run a statewide campaign. Lots of money, especially if you have never held office and no one knows who you are. 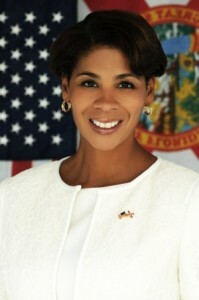 Pam Keith is a tremendous speaker. I firmly believe she would hold her own on a stage with Grayson and Murphy. I think her resume is outstanding. Hell I was one of her earliest supporters! The reality of this situation, though, is that she doesn’t meet the criteria to participate. What is curious to me is that Alan Grayson and David Jolly held a debate. Pam Keith was not invited to participate in that one. There were NO cries of racism or sexism in that case. I’ll tell you why. Publicity. Keith knows this debate is going to be watched by a lot of people and she wants the publicity. Let’s face it, $2,488.00 certainly can’t buy that. Crying racism is not the way to get it. So, in closing, I can’t sign on to this. For those who have jumped on to that bandwagon, you are doing more harm to actual victims of racism than you realize. Exactly. NO Numbers, NO Debate. This when you don’t qualify to participate in the debate.